When the IBM 3390 Direct Access Storage Device (DASD) was rolled out in November 1989, it offered up to 22.7 billion bytes (gigabytes) of storage and allowed customers to store more data in a single DASD than ever before. Boosts in key DASD performance areas -- such as a 40 percent improvement in data transfer rate and 15 percent in average latency -- provided users with a highly reliable, cost effective means of rapidly accessing vast amounts of data. The 3390 represented three times the storage capacity per square foot of floor space over the IBM 3380K; five times over the 3380 Model E; and ten times over 3380 standard models. The new DASDs also delivered an 18 percent reduction in the cost of a megabyte of disk storage. Improvements in three key factors of DASD performance yielded an overall 20 percent improvement in subsystem response time. Seek times -- the time needed to position the read/write head over a track of data -- were reduced to an average of 12.5 milliseconds from 16.0 milliseconds for the IBM 3380K. The 3390 disks rotated faster than those in the 3380. Faster disk rotation reduced rotational delay, the time required for the correct area of the disk surface to move to the point where data could be read or written. In the 3390's initial models, the average rotational delay was reduced to 7.1 milliseconds from 8.3 milliseconds for the 3380 family. The data transfer rate -- the speed that data can move to and from the disk surface -- was also increased, from 3.0 megabytes per second for the 3380 family to 4.2 megabytes per second for the 3390. 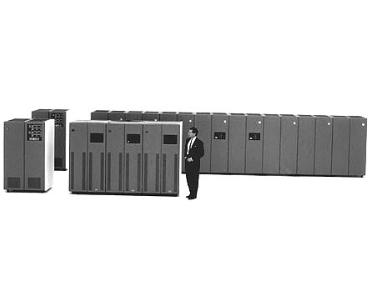 The 3390 Model 1 provided a storage capacity of 3.78 gigabytes to 11.35 gigabytes. The Model 2 had a capacity of 7.56 gigabytes to 22.7 gigabytes. 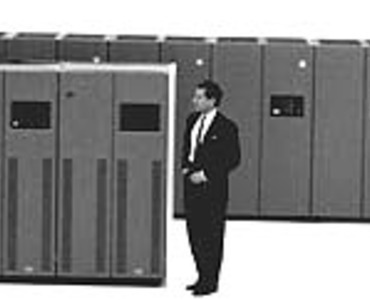 The 3390 attached via the IBM 3990 Storage Control Models 2 and 3 to all ES/3090 models and IBM 308x models through an additional attachment feature. First customer deliveries of the 3390 Models 1 and 2 were scheduled for December 1989 at prices ranging from $90,000 to $275,000. A typical configuration consisting of three 3390 Model units was priced at $759,000. Compared to 3380: average seek time 28% faster, latency 17% reduction, transfer rate 40% faster. Track capacity increased by 19%.